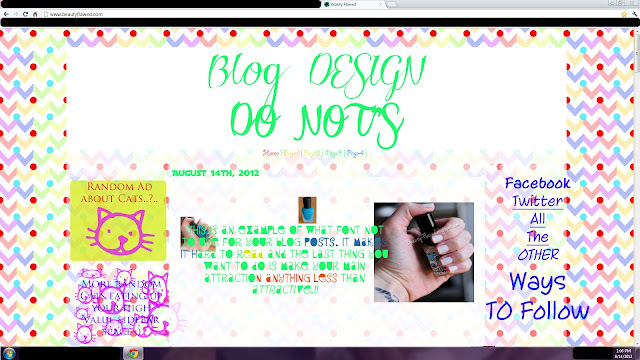 When I first started my blog I had no idea what I was doing when it came to making my blog look and feel presentable. I've been blogging for a little over a year now and I am by no means an expert when it comes to blog design but I have learned a few things along the way. Today I thought I would share with you guys some tips that I think are very important when it comes to making your blog it's very best. Okay so the above picture is something I worked up in Photoshop as an example of what not to do. It's loosely based around the template I use currently with the same widths and a bit of transparency, those are not the bad parts ;). I like to stick with fonts that can be easily read especially for the post body. A common one that is readable is Verdana. I think 2-3 fonts at most for any blog is more than sufficient. Of course use something special for your header just make sure you it's readable. It's no fun trying to read a blog that has bright text on a light background. It's good to stick with a dark color for your post text it makes you're content more enjoyable to read. I use an accent color on text if I want something to stand out. Chevron and Polka dots, my favorite!! Just not together, make sure you have a background that you love but doesn't distract from your content. Having a background that is creative yet simple is a great way to go because not only does it free up visual space it keeps your blog looking clean and professional. If pattern's aren't your thing you can always try using some textures like old paper or just keep it a solid color. Having your text over your images makes your content hard to see and read. Making sure your images are laid out neatly can really help make your blog look more presentable. Lately I've been story boarding my photos together in Photoshop to help keep things neat. If you don't have Photoshop don't worry many other programs can do it and they are free check out Picasa's collage features. Above the fold space is prime real estate on any blog, many sponsors prefer to be seen without having to scroll down. When placing an ad or a new way to follow make sure that these spots look neat and fit within the margin of your sidebars. Otherwise things can start to overlap and create a less than pleasing look for your blog. It's nice to have color incorporated into your design but it's not so nice to use every color in the spectrum. Picking out 3-4 colors to incorporate in your blog will do you a whole lot of good in when everything comes together. I like to pick 3 colors that compliment each other to keep the design visually interesting. I think that covers it for now, keep in mind I am in no way shape or form a expert on this subject. These are just things that I have come across along the way and that I feel are important. I must admit I myself have been guilty of some of these in the past but you live and you learn. What are some things that you consider blog design don'ts? Great post. I also like to use Verdana font. I don't like to many ads and I like when blogs are easy to navigate with a horizontal menu bar. Ad's can be pretty overwhelming especially if they are all over. My number one thing is, do not EVER put music on your blog! Also, don't have an annoying sparkly mouse pointer. Good call! I also dislike music on blog pages it really takes away from the content. Such great advice! I agree 100%! I am sure you helped out a ton of people with this one!!! And I totally agree with the comment above...no MUSIC!!! Thanks! I know right that is a great one. Really great tips Ashley! I agree with the comment above...no music! awesome advice and I have to agree- music on the blog is a big no no! same with any other repetitively flashy graphics that might hurt peoples eyes/ give them a seizure! I find that lately I keep removing more and more widgets and things from my sidebar. I't so funny that I just wrote a bit about awful website layouts! hahaha. Totes agree on all these, Ashley. Totes. This is a great post! I agree with everyone, no music please. And if you must have music, at least have a way for the reader to turn it off. I think one time I spent a good 5 minutes on a blog trying to figure out how to turn the music off, I eventually just left without actually reading any posts because I was so frustrated. Great Great Great tips! What a great idea to share this. Honestly, if someones bog has aspects like that I do not bother reading it because its too confusing. Love the advice. If only I'd heard it when I had myspace 7 years ago. This definitely reminds me of MySpace haha , love this post! Thanks for sharing!! The point you made about text color is very important. I have, on several occasions, immediately clicked off of a website as soon as a black background loaded with neon green or neon pink text printed over it. On that note, I would add never to use a black background. Ever. Not a good idea. Yeah i have to agree...background music is awful.......tiny, unreadable fonts...or fonts and backgrounds clashing to make it unreadable. I hate pointers that have graphics following them...really distracting.Also blogs that have sections all over the place with no real format......i dont know what to read first and it overwhelms me. Im in the middle of a clean up of my blog...as my sidebars are starting to get cluttered.....you just seem to pick up so many badges and stuff along the way..you dont realise how much stuff you have on there.